When Joanna was born, we noticed a little freckle-like indent near her ear. It looks almost like a large pore. The doctors weren't worried so neither were we. 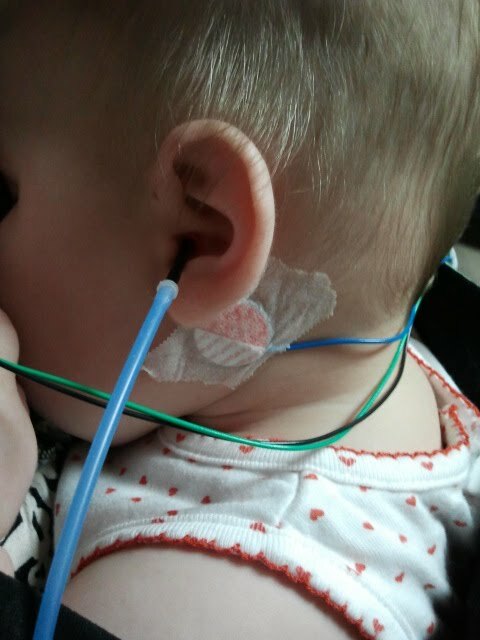 Fast forward to her 5 month birthday and my friend that is an Audiologist asked if we had it checked out. "The nurses said not to worry about it." "Well you need to fire those nurses." Apparently an ear pit can be a sign of a deeper issue with hearing and perhaps the kidneys - who knew? At her 6 month appointment, the doctor referred us to an audiologist in the area and we went to see them to hear if we should be worried. Today was said appointment with the very nice audiologist. After checking in, we went into a quiet room with a comfortable leather recliner next to a lot of machines. The first thing we did was attach some wires to Joanna to measure electrodes. After they were attached, I had to get her to sleep. (I am SO thankful for my Boba!) Normally this would be a piece of cake but sleep's mortal enemy showed up - hiccups. After 15 minutes of Joanna getting frustrated that she couldn't sleep because of hiccups, I turned the lights back on and she was startled - goodbye hiccups! Within a minute she was out. Doc came back and hooked up the wires to a contraption that looked like Zach Morris' cell phone. After what seemed like 10 minutes of testing on one ear, she moved to the other ear. After this test, she used a DVD remote-esque contraption hooked to an earplug and put it inside of one ear, then she put a different plug into the other ear. After that test, she had a much shorter test that seemed like she was taking her temperature in her ear. It lasted a few moments. As soon as the tests were done, Joanna woke up from her nap and the doc went over the results with me. Everything was in the normal range! 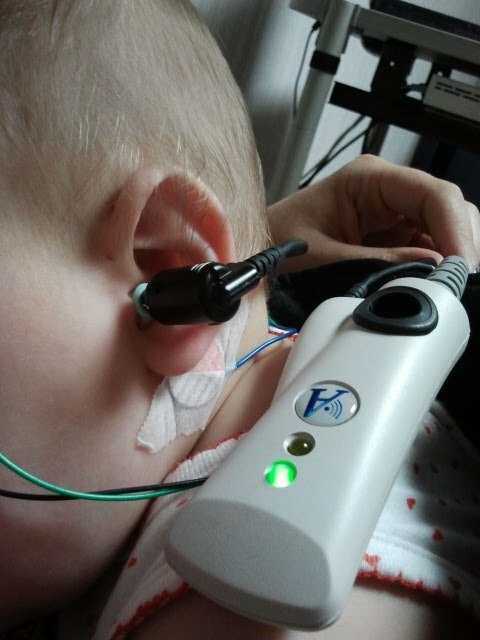 One ear is slightly better than the other but she said this could be due to many things, from fluid to excess pressure. She wasn't concerned so I'm not concerned. She scheduled an appointment for a year from now to follow up. My Boba carrier really came in handy today!